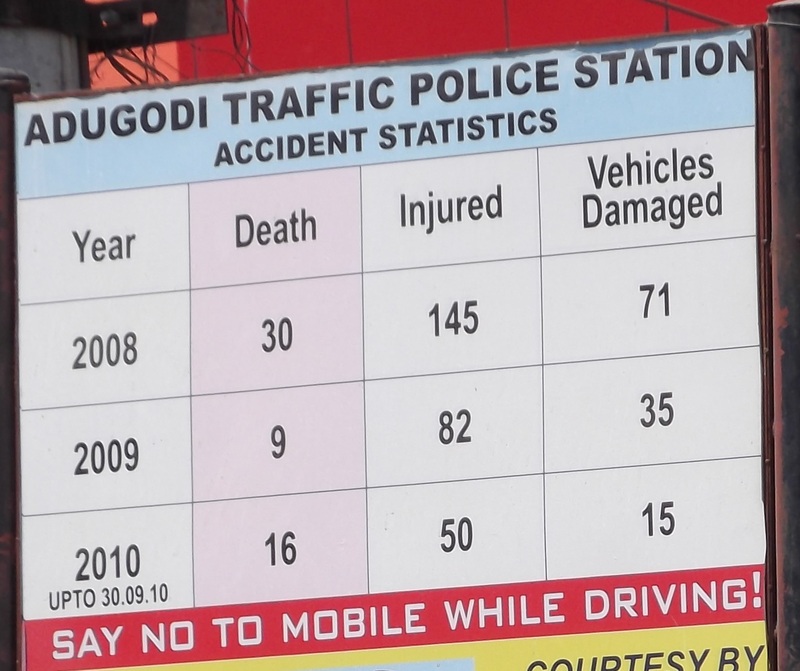 So remember the post I did on the boards listing traffic accidents? Of course you do, because you clicked the link. Well, my mother-in-law's camera was far superior to mine, so here is a better picture. When I mentioned this sign to Jason and commented about how these deaths and injuries seemed excessive, he pointed out another sign closer to the Forum Mall and asked "Isn't this for a different police station than the one you took a picture of [near Sony World]?" If so, good grief. Sony World is maybe 15 minutes from the Forum Mall. So the area this station covered was much smaller than I first assumed. Which makes the statistics even more alarming. I was talking to someone here in Bangalore, and asked about safety on an unrelated subject. They responded, with all seriousness, "Oh, yes, it's very safe. Just like crossing the street." I laughed and told them that to an American, crossing the street isn't safe at all. And yes, I tagged this as medical, because 'ya know, I'm starting to think half of India's medical economy relies on traffic accidents. In 2009, *1156* people died in road accidents in New York. 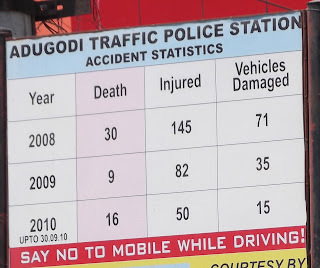 That year 662 people died in road accidents in Bombay. That, even though Bombay packs some 14m people compared to New York's 8m. I think your chances at survival are much better here in India than back home. Do you happen to know the city-wide stats for Bangalore? Estimating from the very few areas I've seen these signs up (and having no idea whether the police station areas are generally the same size), I'm guessing Bangalore stats are much higher. Again, this is just based on my very small sample. While in the gruesome business of discussing death tolls, these are figures that stay constant in any city in the world - no matter how first or third world. While New York may have faster traffic than Bombay or Bangalore, it has a much more advanced medical infrastructure. On the other hand, Indian cities have slower traffic, but far less organised roadways with larger numbers of two wheelers.